The finest non-major golf tournament held in the United States takes place in Fort Worth this weekend at Colonial Country Club. The event – dubbed the Fort Worth Invitational this year – has been held at the same site longer than any other tournament. As a result, CCC and the PGA have this tournament working like a finely-tuned, well-oiled machine. The facilities for the spectators are fabulous, there is ample room at most holes for up close viewing of the action and the overall layout is spectacular and compact. You can catch action on every hole without having to walk miles in the process. The venerable course holds up as well and while scores can be low only once has more than 20 under been the winning score. The only downside has been the inability of to attract a better field in recent years – and the sometimes brutally hot weather in late May. The list of past champions, however, is impressive and includes such all-time greats as Ben Hogan, Sam Snead, Arnold Palmer, Cary Middlecoff, Billy Caspar, Ben Crenshaw, Lee Trevino, Jack Nicklaus, Tom Watson, Phil Mickelson, Sergio Garcia and Jordan Spieth. Look for Red on Sunday relaxing in a luxury skybox by the 13th green with cool beverage in hand. This entry was posted in Texas Sports, Uncategorized and tagged Colonial Country Club, Fort Worth, Fort Worth Invitational, Golf, PGA, Texas Golf, Texas Sports on May 25, 2018 by Red from Texas. From the Annals of the Highway – In 1949, professional golfer Ben Hogan and his wife Valerie were seriously injured in an auto accident. Hogan was born in Stephenville but raised in Dublin and Fort Worth. After his father committed suicide when Hogan was 9, he began to caddy at Glen Garden CC south of town where he met his later tour rival Byron Nelson. He turned pro at age 18 but struggled for almost a decade before winning a professional event. But before his accident in 1949, Hogan had won 54 times on the PGA Tour including two PGA Championships and one U.S. Open victory. The Hogans somehow survived the early morning head-on collision with a Greyhound bus on a fog-shrouded bridge east of Van Horn. Hogan threw himself across Valerie in order to protect her. He likely would have been killed otherwise as the steering column punctured the driver’s seat. Hogan suffered a double fracture of his pelvis, a fractured collar bone and left ankle and a chipped rib. He also suffered blood clots that would cause circulatory problems for the remainder of his life. It seemed doubtful that he would ever compete again at the high level to which his fans were accustomed. After 59 days in the hospital, Hogan began his rehabilitation – mostly by extensive walking. He was back on the course by November and returned to the PGA Tour to start the season at the Los Angeles Open at Riviera Country Club. He finished tied with Sam Snead but lost in a playoff. Hogan would go on the win the U.S. Open in 1950 and five more major championships before he retired in 1959. This entry was posted in Today in Texas History, Uncategorized and tagged Ben Hogan, Byron Nelson, Fort Worth, Golf, Hogan Automobile Crash, Major Championships, PGA, PGA Tour, Texas Golf, Valerie Hogan, Van Horn on February 2, 2018 by Red from Texas. From the Annals of the Iron Horse – In 1887, the Fort Worth and Denver City Railway became the first rail line to enter northwest Texas. The train was run into the new community of Cheyenne in Oldham County. The line was nicknamed “the Denver Road” and operated in the Texas from 1881 to 1982. The FWDC was chartered by the Texas legislature on May 26, 1873. The company would later change its name to the Fort Worth and Denver Railways Co. in 1951. The main line ran from Fort Worth through Wichita Falls, Childress, Amarillo and Dalhart to Texline where it connected with the Colorado and Southern line. This entry was posted in Today in Texas History, Uncategorized and tagged Fort Worth, Fort Worth & Denver City Railway, Railroads, Texas History, Texas Panhandle, Texas Railroads on December 15, 2017 by Red from Texas. This entry was posted in Today in Texas History, Uncategorized and tagged Amon Carter, First TV Station in Texas, Fort Worth, Harry Truman, NBC, Texas Television, WBAP-TV on September 27, 2017 by Red from Texas. The dispute arose when Courtright proposed that his help was needed his “protection.” Short was attempting to sell his interest in the White Elephant to raised money for the defense of his brother who had killed a man in San Angelo and to deal with his other legal problems. Courtright’s interference was complicating the sale. Short was not a man to be intimidated and rejected Courtright’s proposal claiming that he would provide any protection that his saloon needed. Courtright decided it was necessary to show Short what could happen if his services were declined. The dispute boiled over early on the evening of February 8 when Courtright again confronted Short. Short’s version of the events was succinct. Before the encounter was over, Short had shot Courtright five times. 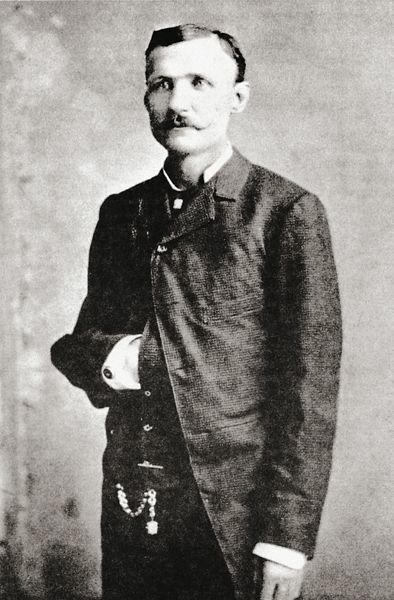 Bat Masterson who witnessed the shootout recounted the action. This entry was posted in Today in Texas History and tagged Bat Masterson, Dodge City, Fort Worth, Longhair Jim Courtright, Luke Short, Tombstone, White Elephant Saloon, Wyatt Earp on February 8, 2017 by Red from Texas. From the Annals of the Religious Right – In 1860, abolitionist Methodist minister Anthony Bewley was lynched. In 1858, Bewley – an outspoken opponent of slavery – established a mission south of Fort Worth. He ran afoul of the so-called vigilance committees who were claiming that abolitionists were plotting to burn Texas towns and murder white citizens. Bewley was targeted primarily on the basis of a letter he allegedly received from another abolitionist earlier in July. The letter implored Bewley to continue with his work in helping to free Texas from slavery. Many were convinced it was a forgery set up to incriminate Bewley. But the letter was widely published and used as supposed evidence that Bewley was fomenting trouble along with other John Brownites in Texas. Bewley knew trouble was coming and took his family to Kansas. A Texas posse caught up with him in Missouri. He was returned to Fort Worth on September 13. Later that evening, vigilantes seized and lynched Bewley. His body was allowed to hang until the next day. He was buried in a shallow grave, but quickly disinterred. His bones were stripped of their flesh and placed on top of Ephraim Daggett’s storehouse and children were allowed to play with them. One cannot know how many in the lynch mob went on to serve in the Confederate military. But stories such as this illustrate clearly why the Confederate “heroes” should continue to be removed from the place of honor that hold in many Texas areas and relegated to the dustbin of history. This entry was posted in Today in Texas History and tagged Anthony Bewley, Civil War, Fort Worth, Lynching, Methodist Church, Texas History on September 13, 2016 by Red from Texas.